I'm so excited by your responses to the Summer Sampler Series quilt along! Whether you plan on making all 12 blocks, just a few or are watching from the sidelines (to be lured in later - HA! ), I think we will have a great time together. We spent a long (5 day) weekend up in northern Michigan for the holiday weekend. The 4th of July is not only Independence Day here in the USA, it is also Mr. Fresh Lemons birthday. There was lots of celebrating and fireworks. The drive home Tuesday was long, lots of traffic on the road. I spent Wednesday recovering from the "weekend", grocery shopping, unpacking, doing laundry. The glamourous side of being a stay at home mom. Today I just wanted to get back into the sewing room and work a little project. Feel like I accomplished something. Does anyone else have days like that? 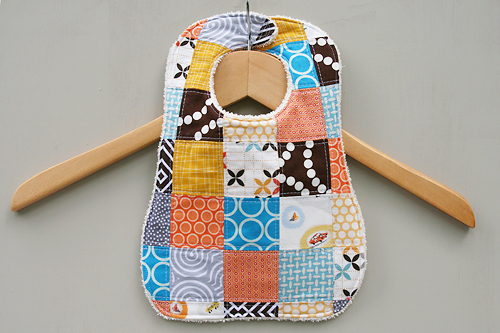 I decided to have fun pulling fabrics and make some bibs. I think both of these would be cute for a boy, don't you? The Echino one is pretty gender neutral which is always nice. I'm not sure what I will do with them yet. My SIL is pregnant and finds out in a week whether it's a girl or boy...might have to hold onto them a little while longer. Otherwise they will probably find their way to my Etsy shop.